* BEST HEAVY DUTY LONG LIFE TARP. * UV PROTECTION ON BOTH SIDES. SUN REFLECTION AND HEAT REDUCTION. * SUPER STRONG 14 X 14 WEAVE HDPE WOVEN CENTER. * 1000 DENIER, 6 OZ / SQ. YARD. * 50 MICRON THICK LDPE LAMINATION BOTH SIDES. * UV TREATED P.P. TWINE REINFORCED HEMS. * HEAT SEALED / DOUBLE STITCHED WATERPROOF SEAMS. EVERY 18" AND IN ALL CORNERS. * HEAVY DUTY MOLDED CORNER REINFORCEMENTS. NOTE: Finish Size is approx. 1-2% smaller than cut size. gym floor cover, camping tarp, boating tarp. 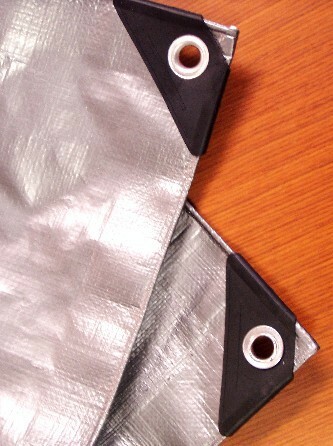 total water-proofed tarp, reinforced hems and rust proof metal grommets.